Reading and share top 20 famous quotes and sayings about Diversions by famous authors and people. 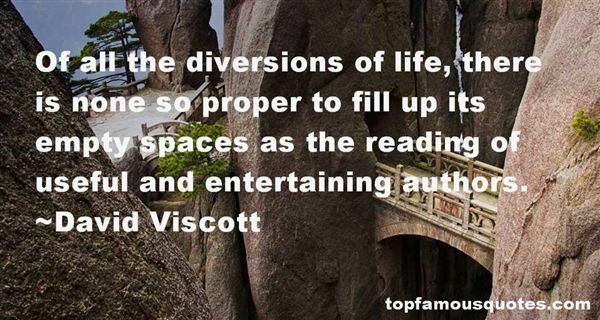 Browse top 20 famous quotes and sayings about Diversions by most favorite authors. 1. "We're not really taught how to recreate constructively. We need to do more than find diversions; we need to restore and expand ourselves. Our idea of relaxing is all too often to plop down in front of the television set and let its pandering idiocy liquefy our brains. Shutting off the thought process is not rejuvenating; the mind is like a car battery -- it recharges by running. You may be surprised to find how quickly daily routine and the demands of "just getting by" absorb your waking hours. You may be surprised to find how quickly you start to see your politics and religion become matters of habit rather than thought and inquiry. You may be surprised to find how quickly you start to see your life in terms of other people's expectations rather than issues. You may be surprised to find out how quickly reading a good book sounds like a luxury." 2. "Think often on God, by day, by night, in your business and even in your diversions. He is always near you and with you; leave him not alone." 3. "When, as my friend suggested, I stand before Zeus (whether I die naturally, or under sentence of History)I will repeat all this that I have written as my defense.Many people spend their entire lives collecting stamps or old coins, or growing tulips. I am sure that Zius will be merciful toward people who have given themselves entirely to these hobbies, even though they are only amusing and pointless diversions. I shall say to him : "It is not my fault that you made me a poet, and that you gave me the gift of seeing simultaneously what was happening in Omaha and Prague, in the Baltic states and on the shores of the Arctic Ocean.I felt that if I did not use that gift my poetry would be tasteless to me and fame detestable. Forgive me." And perhaps Zeus, who does not call stamp-collectors and tulip-growers silly, will forgive." 4. 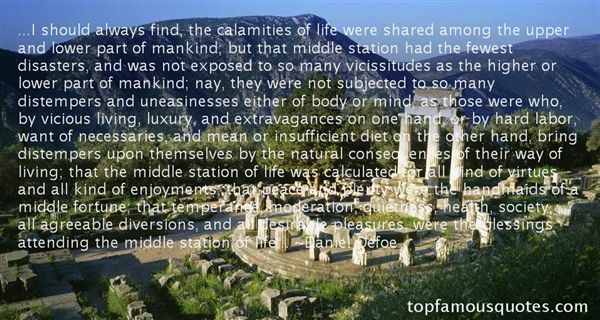 "...I should always find, the calamities of life were shared among the upper and lower part of mankind; but that middle station had the fewest disasters, and was not exposed to so many vicissitudes as the higher or lower part of mankind; nay, they were not subjected to so many distempers and uneasinesses either of body or mind, as those were who, by vicious living, luxury, and extravagances on one hand, or by hard labor, want of necessaries, and mean or insufficient diet on the other hand, bring distempers upon themselves by the natural consequences of their way of living; that the middle station of life was calculated for all kind of virtues and all kind of enjoyments; that peace and plenty were the handmaids of a middle fortune; that temperance, moderation, quietness, health, society, all agreeable diversions, and all desirable pleasures, were the blessings attending the middle station of life..."
5. "Of all the diversions of life, there is none so proper to fill up its empty spaces as the reading of useful and entertaining authors." 6. "Days pass when I forget the mystery.Problems insoluble and problems offeringtheir own ignored solutionsjostle for my attention, they crowd its antechamberalong with a host of diversions, my courtiers, wearingtheir colored clothes; caps and bells. And thenonce more the quiet mysteryis present to me, the throng's clamorrecedes: the mysterythat there is anything, anything at all,let alone cosmos, joy, memory, everything,rather than void: and that, 0 Lord,Creator, Hallowed one, You still,hour by hour sustain it." 7. "It is the devil's greatest triumph when he can deprive us of the joy of the Spirit. He carries fine dust with him in little boxes and scatters it through the cracks in our conscience in order to dim the soul's pure impulses and its luster. But the joy that fills the heart of the spiritual person destroys the deadly poison of the serpent. But if any are gloomy and think that they are abandoned in their sorrow, gloominess will continuously tear at them or else they will waste away in empty diversions. When gloominess takes root, evil grows. If it is not dissolved by tears, permanent damage is done." 8. "Some days passed before I could rid my thoughts of Thecla of certain impressions belonging to the false Thecla who had initiated me into the anacreontic diversions and fruitions of men and women. Possibly this had an effect opposite to that Master Gurloes intended, but I do not think so. I believe I was never less inclined to love the unfortunate woman than when I carried in my memory the recent impressions of having enjoyed her freely; it was as I saw it more and more clearly for the untruth it was that I felt myself drawn to redress the fact, and drawn through her (though I was hardly conscious of it at the time) to the world of ancient knowledge an privilege she represented. The books I has carried to her became my university, she my oracle." 9. "I tried to build an igloo out of orange peel but it kept falling down and even when it stood up I didn't have an eskimo to put in it, so I had to invent a story about 'How Eskimo Got Eaten', which made me even more miserable. It's always the same with diversions; you get involved"
10. "As an English major I was familiar with the stories of dozens of writers trying to get their work done among the multifarious diversions of the world and the hurdles of their own vices. A professor had said that what saved writers is that they, like politicians, had the illusion of destiny that allowed them to overcome obstacles no matter how nominal their work." 11. "Bien sûr ces changements de comportement culturel et l'invention de mumltiples diversions font partie d'un système économique qui me dépase. J'envisage ce système comme un bain dans une piscine anémiée, stérile, bondée, puant le chlore, en comparaison d'une délicieuse baignade dans un lac au fond des bois, la berge du lac bordée de nénuphars en fleurs où sont perchées de petites tortues, un ou deux hérons dans les grands pins ou dans l'eau peu profonde, quelques serpents d'eau parmi les massifs d'ajoncs, et quand vous plongez vous voyez les poissons qui se reposent immobiles sous les bûches dressées. Même les profondeurs obscures semblent séduisantes en comparaison d'une piscine, comme une promenade printanière sous la pluie dans les bois en comparaison d'une série télévisée où des gens se font descendre ou tabasser à New York ou à Los Angeles tandis que des durs à cuire enchaînent d'insipides répliques soi-disant spirituelles." 12. "Because to the poor, books are not diversions. Book are siege weapons." 13. "When believers have a low view of God, everything focuses on meeting felt needs within the body of Christ. When the church adopts such a perspective, it often offers people nothing more than spiritual placebos. It centers on psychology, self-esteem, entertainment, and a myriad of other diversions to attempt to meet perceived and felt needs." 14. "Poorer people tend to watch more television because they can't afford other diversions." 15. "Not that happiness is dull. Only that it doesn't tell well. And of our consuming diversions as we age is to recite, not only to others but to ourselves, our own story." 16. "His heaven is like himself: strange, interesting, astonishing, grotesque. I give you my word, it has not a single feature in it that he actually values. It consists — utterly and entirely — of diversions which he cares next to nothing about, here in the earth, yet is quite sure he will like them in heaven. Isn't it curious?" 17. 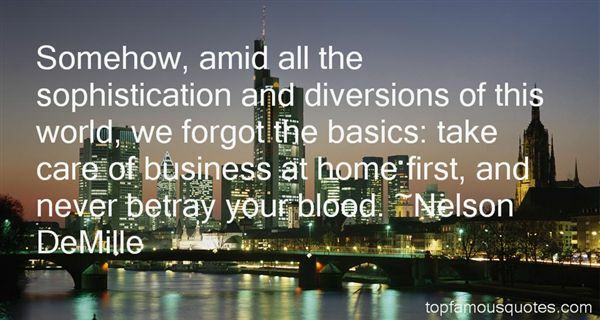 "Somehow, amid all the sophistication and diversions of this world, we forgot the basics: take care of business at home first, and never betray your blood." 18. "A garden path,' write the landscape architects Charles W. Moore, William J. Mitchell, and William Turnbull, 'can become the thread of a plot, connecting moments and incidents into a narrative. The narrative structure might be a simple chain of events with a beginning, middle, and end. It might be embellished with diversions, digressions, and picaresque twists, be accompanied by parallel ways (subplots), or deceptively fork into blind alleys like the althernative scenerios explored in a detective novel." 19. "It is terrible that we all die and lose everything we love; it is doubly terrible that so many human beings suffer needlessly while alive. That so much of this suffering can be directly attributed to religion—to religious hatreds, religious wars, religious taboos, and religious diversions of scarce resources—is what makes the honest criticism of religious faith a moral and intellectual necessity. Unfortunately, expressing such criticism places the nonbeliever at the margins of society. By merely being in touch with reality, he appears shamefully out of touch with the fantasy life of his neighbors." 20. "I think the great thing about grandparents is seeing another home, realising that people you love can have different priorities, different diversions, different opinions and lead quite different lives from the ones you see every day, and that is immensely valuable." Religion is like wax. How anyone deals with it is decisive for how it will look like."